One day last week we went out of town for the day and drove back home after dark. It was a beautiful, clear night and we drove for hours in the dark, mostly with nothing but trees on either side of the road. The moon was two days past full, huge in the sky and incredibly bright. Hills far off in the distance, that would normally be hidden by the darkness, were clearly outlined against the brightness in the sky. The moonlight illuminated clearings and made trees cast shadows across frozen ponds. As we drove I couldn't help but be amazed at the fact that the moon produces no light. There we were, driving through a night much brighter than normal, with the moon glowing in the sky, and yet the moon cannot produce light at all. All that light? It was actually coming from the sun. Obviously, I knew this already, just like you do. But as I looked at the shadows cast by the trees, it seemed amazing that all the moon can do is reflect the light from another source. And that made me think of us. Jesus said, "You are the light of the world. A town built on a hill cannot be hidden. Neither do people light a lamp and put it under a bowl. Instead they put it on its stand, and it gives light to everyone in the house. In the same way, let your light shine before others, that they may see your good deeds and glorify your Father in heaven" (Matthew 5:14-16). You are the light of the world. How is that possible? How can we possibly be the light of the world when we are simply human, the same as all the people around us? The answer lies in something else Jesus said. "When Jesus spoke again to the people, he said, 'I am the light of the world. Whoever follows me will never walk in darkness, but will have the light of life'" (John 8:12). Jesus is the light of the world. It is His light that illuminates the darkness. We are like the moon. 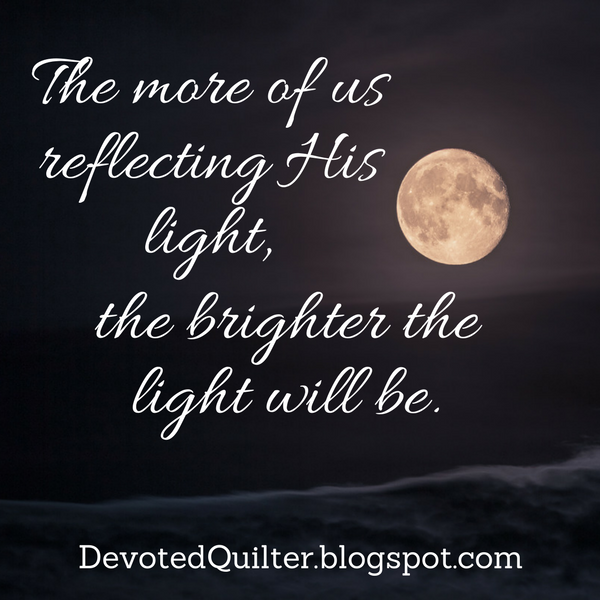 We can't produce light on our own, but we can reflect the light that comes from another source, and so we reflect the light of Jesus into the world around us. This is no small thing! Jesus is not here, physically, to shine light into this dark world of sin, but because we can reflect His light, there is light in the darkness. When surrounded by darkness, light draws attention. In the same way, when surrounded by sin, Christians draw attention. Our task then is to make it plain that the light doesn't come from us. When we point others towards Jesus, the source of our light, then we make it possible for them to move out of darkness too. And the more of us reflecting His light, the brighter the light will be in the world.